Pioneers in the industry, we offer cooling tower fans and aluminum fans for cooling tower from India. Our company is engaged in providing a huge array of Cooling Tower Fans. These are fabricated using the best grade quality components. Our towers work on the principle of counter flow, which results in the flow of water while the air is pulled upwards by a fan. Thus, the air that is generated is fresher, cooler and less saturated. 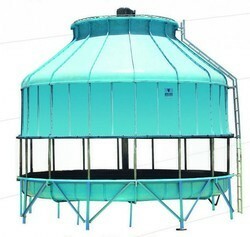 The FRP round bottle type cooling towers offered by us are light in weight and can be easily installed on the roof without any special reinforcement. These towers are provided with a direct driven axial fan, which ensures that the system is free from problems faced with belt & gear drives. The main features of this tower include less air resistance to water, saving in operational costs, Resistant to waterborne bacteria and organisms And light in weight and low power consumption. Aluminum Fans for cooling tower offered to come in quality construction finish and provide for optimum functional usage as well as high energy savings. 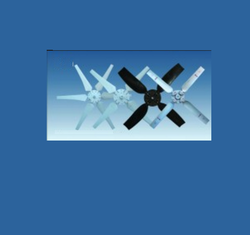 Further, the assembly of these aluminum fans is aerodynamically designed and come with the support of adjustable FRP/aluminum alloy blades that provides for large airflow with comparatively low static pressure. Further, the pitch angle of thee fans can also be adjusted to achieve changing of fan power. Looking for Cooling Tower Fans ?